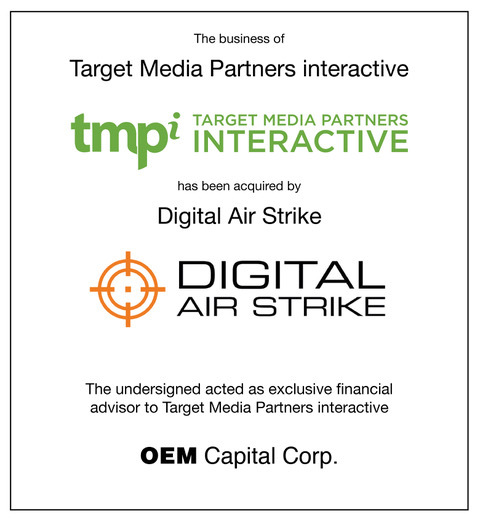 Target Media Partners, primarily a provider of lead generation services to the automotive dealer community, had successfully made the transition from traditional print media to digital through the creation, nurturing and development of Target Media Partners interactive (“TMPi”). The time had come to find a new home for TMPi where it could rise to the next level. Through a sale process initiated and guided by OEM Capital Corp., TMPi found Digital Air Strike which focuses on monitoring, improving and managing consumer engagement for automotive dealerships and other businesses. By combining the two sets of product offerings, Digital Air Strike can offer a broader and stickier service to dealerships. The owners of a 21st Century innovator in the travel business were looking for a buyer able to build on its strong and recognized brand. Changes in the retailing landscape required additional investment capital that was not available to them. OEM Capital Corp. was able to complete a sale of the business to a Canadian owned group with the resources necessary to fund the future development of the brand. The owner of a pioneer in New York coffee retailing business synonymous with high quality was looking for a buyer able to continue and build on his brand. The New York coffee business has become cutthroat with waves of new entrants opening stores on every corner. 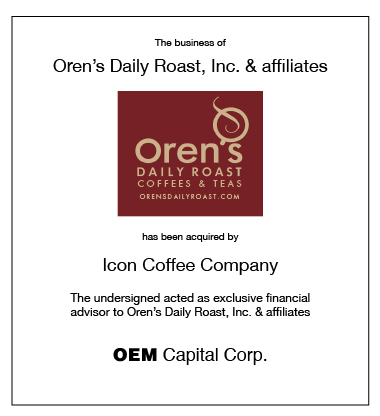 OEM Capital Corp. was able to find a venture capital-backed buyer with deep roots in the coffee business with the capability to complete the acquisition and fund the future development of the business. ASK Wholesale Hardware Co., Inc. 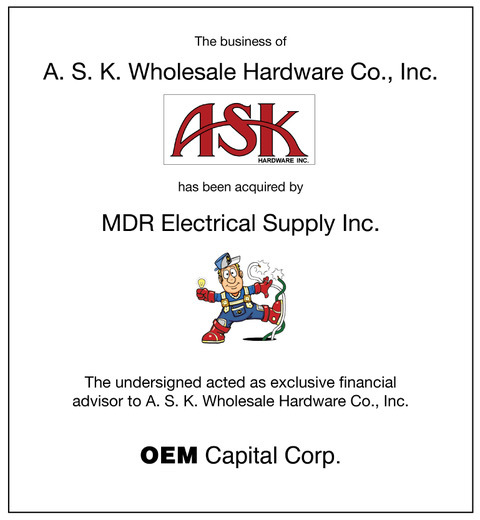 ASK Wholesale Hardware Co., Inc., a long established distributor of large hardware items in the Greater New York area, and MDR Electrical Supply Inc., a distributor of small hardware items in the same geographical region, were interested in merging. The owner of ASK was looking for an exit plan over time and MDR, a fast growing force in the New York hardware distribution space, was looking to acquire a broader customer base, an extended product line and valuable new vendor relationships. ASK retained OEM Capital Corp. to assist in the process. OEM Capital Corp. worked with both ASK and MDR to develop an extended earnout mechanism to facilitate a transaction that satisfied the needs of both parties. United States Luggage Co., LP (“USL”), a manufacturer of business cases, purchased a leading brand of travel ware originally headquartered in Half Moon Bay, California. OEM Capital Corp., assisted by legal counsel, negotiated the transaction and concluded the purchase pursuant to Section 363 of the Bankruptcy Code. 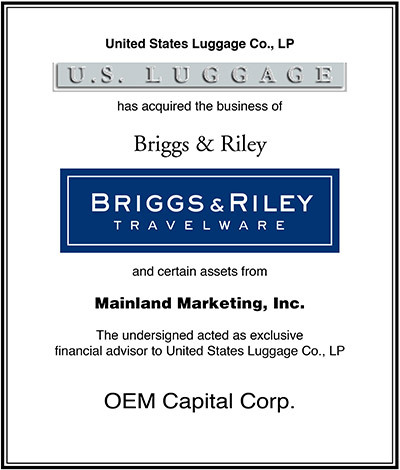 Under USL, Briggs and Riley flourished, becoming once again a preeminent name in travel cases. 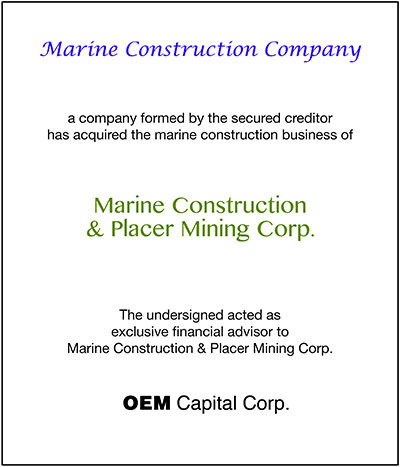 Marine Construction & Placer Mining Corp. is engaged in marine construction in New York harbor and surrounding waterways. The company is also engaged in recovering placer gold deposits off the coast of Alaska in the Bering Sea. The senior lender wanted to limit inter-operational business risk by separating the two businesses. This was achieved through a debt swap in exchange for assets and business operations. 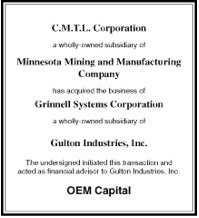 OEM Capital Corp. provided financial advice in connection with the restructuring and assisted the company complete the transaction. 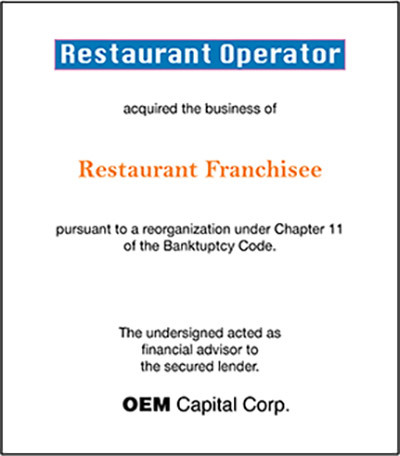 OEM Capital Corp. represented the interest of the secured lender in the bankruptcy of Restaurant Franchisee. Working with the debtor in possession, OEM Capital Corp. was able to negotiate the sale of the business of Restaurant Franchisee to Restaurant Operator through a reorganization of the company under the Bankruptcy Code. This involved a complicated negotiation of the interests of the senior lender, the franchisor, the various landlords, the classes of unsecured creditors, the shareholders of the company and the prior management. The senior lender is likely to obtain full recovery over time. IT Services Company was in financial difficulty as a result of borrowing a substantial amount from a bank to finance a startup business in a related field. When IT Services Company was unable to repay the senior lender, the sale of the business was arranged to a publicly listed staffing company. The sale was structured under Article 9 of the Universal Commercial Code, providing some recovery for the senior lender. OEM Capital Corp. provided the chief restructuring officer and managed the sale process. 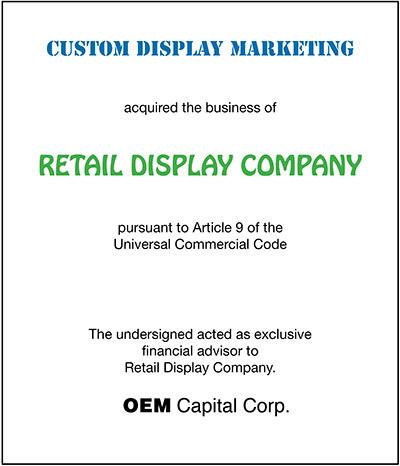 Retail Display Company had previously been restructured following the recession in 2008. The senior lender had been repaid, leaving the restructured vendor debt in the senior position. When the company decided to move from being a manufacturer to sub-contracting its product requirements, it provided an opportunity to de-leverage the company. 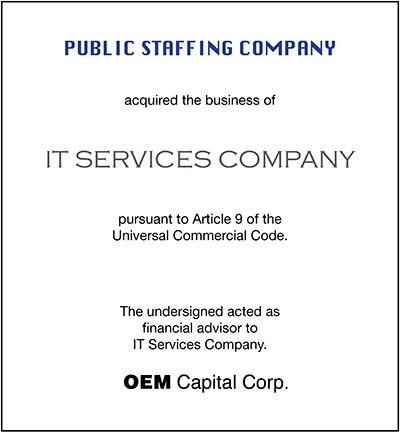 OEM Capital Corp. provided a chief restructuring officer to manage the sale of the business, pursuant to Article 9 of the Universal Commercial Code, to a new company, principally owned by former secured creditors. Prior unsecured debt was discharged through the sale process. The balance of the secured debt was retired through the process of liquidating the assets of the manufacturing facility at auction. 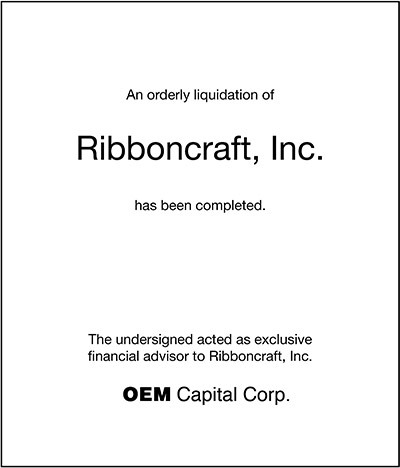 A privately owned manufacturer of thermal transfer ribbons had been incurring large losses as a result of poor financial management and excessive expenditures on perquisites. OEM Capital Corp. redirected the efforts of the firm towards divesting real estate and excess assets, trimming expenditures and closing a European manufacturing joint venture. This restored the business to financial stability. The company was subsequently liquidated. This privately owned manufacturer of packaged terminal air conditioners, had diversified away from its core business, resulting in substantial losses. This placed it in default of its bank covenants. OEM Capital Corp. assisted the firm to make certain organizational changes, divest itself of non-core businesses and refinance with a finance company. Community Medical Transport, Inc. (“CMTI”), a publicly traded company (NASDAQ: CMTI) based in White Plains, New York, provides medical and other specialized transportation services through its subsidiaries in the greater New York metropolitan area and selected counties of New York and New Jersey. The company suffered declining earnings as a result of an acquisition. This placed it in default of its bank covenants. 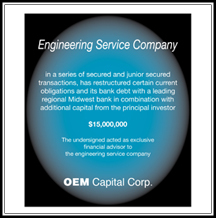 OEM Capital Corp. assisted the firm to make certain organizational changes and refinance with a finance company. A manufacturer of marine auto-pilots and fuel management systems had invested its available resources in the development of a new auto-pilot and supporting inventory. OEM Capital Corp. saved the company from bankruptcy by stopping the manufacturing and renting 40% of the facility. In addition, OEM raised additional cash by negotiating the sale of a non-exclusive right to manufacture the new auto-pilot. The company now has no debt and has continued to operate profitably. OEM Capital was retained by a growing AMEX-listed manufacturer of specialty printers and high-frequency electronic connectors, to refinance a portion of its debt, secure financing for acquisitions, and improve net worth. The company was facing a redemption date on one of its bonds. 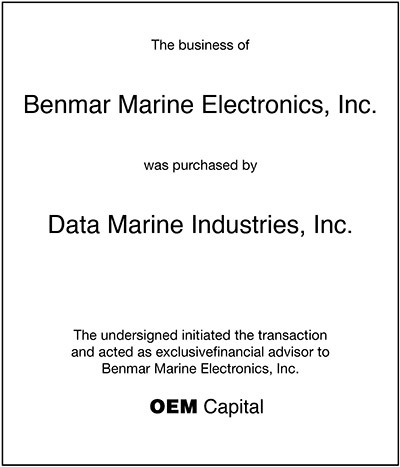 OEM Capital Corp. devised a strategy that allowed the company to secure the necessary financing using the sale value of each of its businesses as collateral and assisted in negotiations with Heller Financial, Inc.
OEM Capital was retained by a NYSE-listed company to sell its Silicon Valley subsidiary which manufactured and sold computer imaging systems. The subsidiary was experiencing a weekly cash loss in excess of $100,000 due to delays in the introduction of a new product to replace an aging product line. After a review that determined the new product would not be competitive, the business was scaled back and sold to a buyer who immediately moved operations. The lease obligation in a nearly vacant office park was transferred to another company. The largest licensee of a major car and truck rental company was under a severe cash squeeze. OEM Capital Corp. arranged an interim bridge loan and negotiated the sale of the company to a subsidiary of a major automobile manufacturer. The original shareholders were relieved of all liabilities and received a cash price well in excess of the company’s book value. 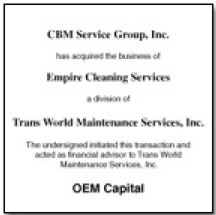 Trans World Maintenance Services, Inc., a privately owned building cleaning and maintenance company serving the New York metropolitan area, retained OEM Capital to devise and execute a strategy to help increase shareholder value. After revenues had reached $35 million, the company was experiencing large cash outflows due to a reduction in revenue and reduced contract margins. A very large customer was in danger of being lost and another had just gone bankrupt. Within a short space of time, OEM Capital Corp. was able to stabilize the business and sell off a marginal division. Subsequently, OEM was able to arrange the restructuring of the bank loan. 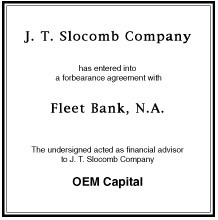 J. T. Slocomb Company, a privately owned supplier of critical components to the major jet engine manufacturers, was unable to react quickly enough to contraction in the military and commercial aerospace markets. This resulted in a severe working capital crisis and defaults in loan covenants. OEM Capital Corp. was able to restructure the business, which led to a successful reorganization of the company under Chapter 11 and substantial recoveries by the lenders and other creditors. The owners of a privately held fabricator of electronic enclosures in financial difficulty wished to sell their business. OEM Capital Corp. organized a sales program that put the business in its best light and permitted the shareholders to realize an above average valuation. IRT Corporation, debtor in possession, is a publicly held manufacturer of advanced x-ray vision inspection and process control systems, and provides radiation services for sterilization of medical products, improvement of silicon power transistor performance and color enhancement of gemstones. The company was in default of its bank covenants and was having difficulty funding operations. OEM Capital Corp. worked with the company and the bank to arrange a sale of the business under the protection of Chapter 11, which resulted in substantial funds being generated for the bank and other creditors. Thermo Instrument Systems Inc., a publicly held company listed on the American Stock Exchange, is a leading manufacturer of analytical instruments used to detect and monitor air pollution, nuclear radioactivity, complex chemical compounds, toxic metals, and other elements in a broad range of substances. Thermo Instrument Systems Inc. is a subsidiary of Thermo Electron Corporation, a New York Stock Exchange listed company with interests in analytical and monitoring instruments, biomedical products, paper making and recycling equipment, alternative-energy systems and other specialized products. Original Cylinder Corporation is a re-conditioner of used automobile brake boosters and master cylinders, based in Los Angeles. It remanufactured boosters without regard to its inventory levels. The work force was reduced by 20% and an aggressive marketing campaign was instituted to boost sales. The company began to generate substantial cash to its owners. 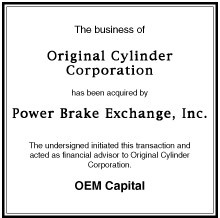 Subsequently, OEM Capital Corp. arranged the sale of the business to Power Brake Exchange, Inc. a privately held remanufacturer of brake master cylinders, based in San Jose. This enabled a cash distribution to be made to the investor group. 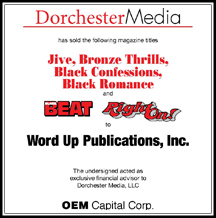 OEM Capital Corp. was retained by the Dorchester Publishing Group to restructure and sell all of its assets, which included genre magazine and book and publishing operations. While disposing of assets in a series of transactions, an orderly wind down of operations was also accomplished. During this period, 12 magazine titles were sold in 3 separate transactions. 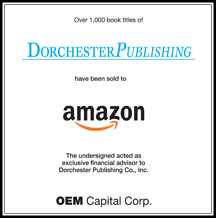 The sale of over 1000 of Dorchester’s book titles resulted in a recovery of arrear royalty obligations by participating authors. 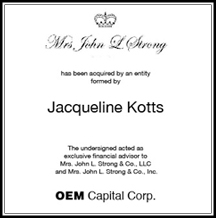 Mrs. John L Strong & Co.
Mrs. John L Strong & Co. is a New York based luxury stationer, which caters to wealthy clientele that has included US Presidents and the English Royal Family. 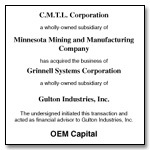 OEM Capital Corp. conducted a sale of the business sale in accordance with section 363 of the USC Bankruptcy Code. We initiated and conducted preliminary discussions with over 30 potential buyers, received 7 competing offers, and ran an auction, the result of which was a purchase price that approximated three times the original “stalking horse” bid. Worksafe Industries, Inc., a publicly listed company headquartered in Huntington Station, New York, is a major US manufacturer of limited use chemical and flame retardant protective clothing as well as heat and fire resistant gloves. Additionally, Worksafe manufactures seamless knit gloves that provide hand and arm protection against abrasions and cuts. Eastco Industrial Safety is a leading distributor of safety products to industrial and environmental businesses with a strong presence in the New York metropolitan area. OEM Capital Corp. was retained to sell a privately owned distributor of products sold exclusively to the hotel industry. The seller, which had determined that the purchaser was the best fit for the business, required assistance in consummating the sale on terms favorable to both parties. OEM Capital was retained to sell a family owned distributor of electronic components. In order to realize maximum value, we structured the transaction in a way that gave a competitor the benefits of added sales volume without the obligation of costs that might arise from a facility shutdown. A privately held business experienced a cash crisis at a time when the owners wished to retire and sell the company. 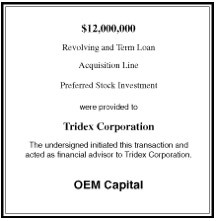 OEM Capital Corp. managed cash flow by actively communicating with trade creditors while simultaneously holding an auction of the business. The company was sold to a competitor at a price that not only satisfied creditors in full but provided shareholders with much more cash than might have been realized in a liquidation. The controlling stockholder of this engineering contractor brought in OEM Capital Corp. to manage the restructuring of the company. OEM Capital Corp. provided a chief restructuring officer who subsequently took over a CEO. In addition to the debt re-structuring, a total reorganization of the company’s administration was accomplished with a savings of over $2 million in annual overhead expenses. OEM Capital Corp.’s initiatives also resulted in numerous operational improvements. 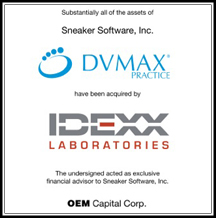 Sneakers Software, Inc. designed and sold practice management applications for veterinary medical practices and laboratories. The company retained OEM Capital Corp. to handle the disposal of its assets through a sale in bankruptcy. The proceeding facilitated the settlement of complex shareholder litigation. OEM Capital Corp. contacted over 200 potential acquirers and received bids from three competitors. Ultimately the acquisition proved an attractive fit for IDEXX, a publicly traded major veterinary science concern. 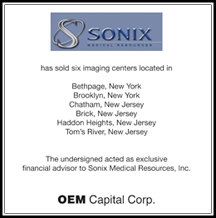 Sonix Medical Resources, Inc. Debtor-in-Possession retained OEM to sell its operating radiological imaging centers in accordance with section 363 of the US Bankruptcy Code. 33 potential buyers executed confidentiality agreements in response to inquiries initiated by OEM, resulting in a dozen bids for various assets. Ultimately, 6 centers were sold to 3 separate buyers, including Radnet, Inc., the largest operator of free-standing radiology clinics in the US. The Arbor Strategy Group helps clients address a wide variety of growth issues through strategic brand innovation, a comprehensive process of identifying relevant, high-potential market space and developing successful new concepts and products to fill that space. The GfK Group, the parent of GfK Custom Research, is the No. 4 market research organization worldwide. Its activities cover the three business sectors of Custom Research, Retail and Media. The Arbor Strategy Group was looking to align itself with a larger organization in order to extend its market presence. After an exhaustive search, GfK Custom Research was selected as the perfect partner. Coffee Distributing Corp. is the largest office coffee service provider in the greater New York area. Compass Group, listed on the London Stock Exchange, is a leading food service company with annual revenues of £14.5 billion. 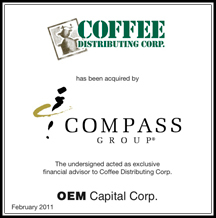 Compass Group pursued the acquisition of Coffee Distributing Corp. over an eight year time frame. 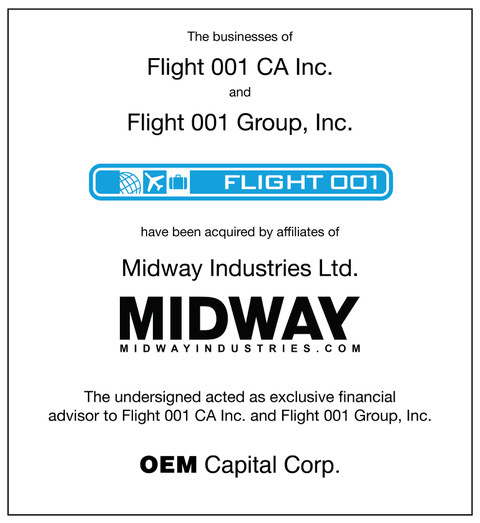 OEM Capital Corp. assisted in discussions with many other candidates over the eight year period. Compass Group was adjudged to be the best fit. Precise Corporate Printing, Inc., a privately owned commercial and stationery printer headquartered in Brooklyn, New York and primarily serving customers in the New York metropolitan area, retained OEM Capital Corp. to assist it refinance its working credit lines. The refinancing of Precise was arranged through United Jersey Bank. 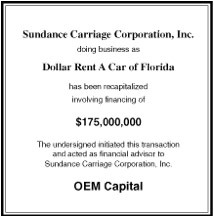 OEM Capital arranged the recapitalization of All Island Lease-A-Car, Inc. with financing provided by a major car manufacturer. A 75 year old publishing firm with limited financial resources was experiencing profit pressure in its core business. Its only competitor was owned by a major newspaper publisher. OEM Capital Corp. helped the company to acquire its competitor by arranging the purchase and securing the financing. 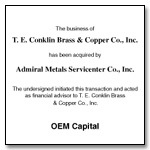 OEM Capital Corp. is a specialty investment banking firm. We provide financial advice on how to maximize the value of businesses and how to finance growth. We have been particularly active in the recapitalization and sale of companies in the car and truck rental industry. OEM Capital helped a private service company sell its court reporting business. We were able to quickly locate a synergistic buyer who offered a premium price. 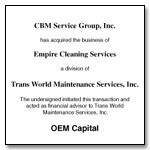 Trans World Maintenance Services, Inc., a privately owned building cleaning and maintenance company serving the New York metropolitan area, retained OEM Capital to devise and execute a strategy to help increase shareholder value. One element of our program involved divesting a non-core business to improve the company’s working capital position. Windswept Environmental Group, Inc., a publicly traded provider of environmental remediation services, retained OEM Capital Corp. to assist in the retirement of debt and repurchase of stock from its controlling shareholder. 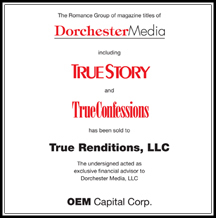 The transaction was financed by a private placement with Laurus Master Fund, Ltd.
innovative USA, Inc., a privately held publisher of children’s books, located in South Norwalk, Connecticut, retained OEM Capital Corp. to assist the business recover from the effects of September 11, 2001 and increase shareholder value. The refinancing of the company was a critical element of the assignment. 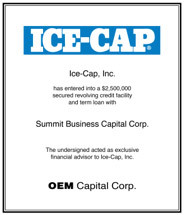 Ice Air, LLC retained OEM Capital Corp. to assist in arranging a revolving credit facility for the purposes of financing working capital and growth needs. Ice Air, LLC is a leading manufacturer and distributor of packaged terminal and water source air conditioning units for new construction and the replacement market. People’s United Bank is the largest regional banking organization headquartered in New England. With the acquisition of the Chittenden family of banks, it has grown to seven banks with more than $21 billion in assets, and more than 300 branches in Connecticut, Maine, Massachusetts, New Hampshire and Vermont and in Westchester County, New York. 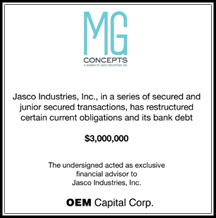 After sales had declined by over two thirds, Jasco retained OEM to work with its bank lender to obtain default waivers. Total funded debt (including an insurance company mortgage loan on a sister company’s property) represented 150% of the company’s revenue. OEM worked with management to control costs, and with the secured lenders and trade creditors to restructure the balance sheet. Funded debt now represents less than a week’s worth of revenue. Original Cylinder Corporation is a privately held remanufacturer of brake master cylinders, based in Los Angeles. Power Brake Exchange, Inc. is a privately held remanufacturer of brake master cylinders, based in San Jose. El Globo of North America, Inc. is a privately held corporation engaged in the wholesale and retail bakery business in South Florida. J. T. Slocomb Company is a privately owned precision machining and metals fabricating house serving the aerospace industry. OEM Capital was retained to improve operating performance and restructure debt and other obligations. 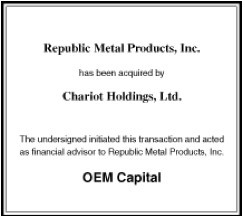 Republic Metal Products, Inc., a fabricator of electronic enclosures retained OEM Capital to managage its sale. Although the industry was depressed and the company had experienced successive years of losses, we secured a premium price for the company. OEM Capital was retained by Mid-State Bank and Trust to assist in a loan workout for a steel fabricator on which they had foreclosed. We secured a buyer and helped in the negotiations. The First Boston Corporation had been retained by Saxon to manage a competitive bidding process. 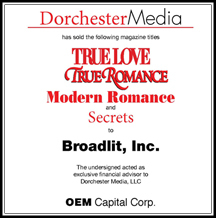 OEM Capital assisted the successful acquirer, an investor group with experience in the disposable dinnerware industry. We advised on the negotiations and arranged $25 million in financing from Security Pacific Business Credit, Inc.
Multistack International Limited, a publicly listed Australian manufacturer of modular air conditioning systems headquartered in Boronia, Victoria, retained OEM Capital Corp. to assist it refinance the long term debt of Airflow Company. Airflow Company, a Frederick, Maryland, manufacturer of close-control air-conditioning systems, is the second largest supplier of air-conditioning systems for computer and telecommunication installations in the US. The refinancing of Airflow’s long term debt was arranged through NationsBank N.A. The funds were used to prepay and reschedule debt due to BTR plc, the prior owner of Airflow Company. Multistack International Limited, a publicly listed Australian manufacturer of modular air conditioning systems headquartered in Boronia, Victoria, retained OEM Capital Corp. to assist it refinance its wholly owned subsidary Multistack Inc., located in West Salem, Wisconsin. Multistack Inc. manufactures modular air conditioning systems, based on designs and patents belonging to Multistack International Limited. 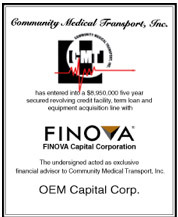 The refinancing of Multistack Inc. was arranged through FINOVA Capital Corporation. 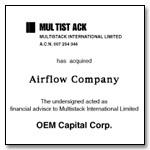 Multistack International Limited, a publicly listed Australian manufacturer of modular air conditioning systems headquartered in Boronia, Victoria, retained OEM Capital Corp. to assist it negotiate and finance the acquisition of Airflow Company from BTR plc. Ziegler Chemical & Mineral Corp., a privately owned gilsonite mining company and manufacturer of asphalt products, retained OEM Capital Corp. to assist in developing and executing strategies to increase shareholder value. An element of the assignment was the retirement of the outstanding debt with JPMorgan Chase Bank, N.A. Dash Optimization retained OEM Capital Corp. to assist in maximizing value for shareholders. Fair Isaac has acquired Dash Optimization, which develops and markets Xpress-MP, the world’s leading software product for modeling and optimization. Xpress-MP, a suite of mathematical modeling and optimization tools used to solve linear, integer, quadratic, non-linear, and stochastic programming problems, solves large-scale optimization problems and enables better business decisions and resulting financial benefits in areas such as supply chain management, operations, logistics and asset management. OEM Capital was retained by a growing AMEX-listed manufacturer of specialty printers and high-frequency electronic connectors, to refinance a portion of its debt, secure financing for acquisitions, and improve net worth. OEM Capital developed alternatives and assisted in negotiations with Heller Financial, Inc.
An AMEX-listed company had developed a strong professional audio equipment business. OEM Capital suggested the opportunity, and initiated merger discussions. The acquisition helped Mark IV’s Electro-Voice subsidiary become a $100 million company. V Band Corp., a public company based in Elmsford, New York and listed on Nasdaq, is a leading supplier of turnkey instant access voice communication systems. These systems include sophisticated communications workstations, switching equipment, peripheral products, project management, technical services and WAN solutions. V Band products and services are used worldwide by financial services organizations for the trading of stocks, bonds and other financial instruments. Other industries served include the mission critical communication requirements of the electric power industry and emergency services providers. The National Bank of Canada, a major international financial institution, has total assets of over C$ 50 billion. OEM Capital was retained by a NYSE-listed company to sell its Silicon Valley subsidiary which manufactured and sold computer imaging systems. We were able to eliminate large cash outflows and divest the business to a competitor within the prescribed deadline. AFP Imaging Corp., a $30 million NASDAQ listed manufacturer of imaging equipment based in Elmsford, New York, retained OEM Capital to assist it finance the acquisition of the business of Visiplex Instruments Limited. AFP’s products are sold worldwide to the medical, dental and publishing industries. Visiplex, an $11 million privately held company also based in Elmsford, New York, manufactures and sells compact imaging cameras and very high resolution monitors for inclusion in sophisticated medical equipment. Financing for the acquisition was arranged with FINOVA Capital Corp. which made available $9,850,000 in revolving and term loan facilities to AFP. IRT Corporation, debtor in possession, is a publicly held manufacturer of advanced x-ray vision inspection and processcontrol systems, and provides radiation services for sterilization of medical products, improvement of silicon power transistor performance and color enhancement of gemstones. Thermo Instrument Systems Inc., a publicly held company listed on the American Stock Exchange, is a leading manufacturer of analytical instruments used to detect and monitor air pollution, nuclear radioactivity, complex chemical compounds, toxic metals, and other elements in a broad range of substances. 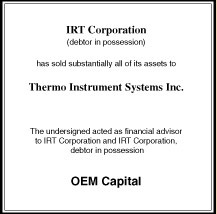 Thermo Instrument Systems Inc. is a subsidiary of Thermo Electron Corporation, a New York Stock Exchange listed company with interests in analytical and monitoring instruments, biomedical products, paper making and recycling equipment, alternative-energy systems and other specialized products.